As some of my friends already know (and against most of their wishes), I’m trying to finish off a lot (this clearly is an understatement) of the work I’ve started and not finished over the past years. I thought I’d get into the habit of a writing a devlog on my blog rather than on TIGSource or on a separate site in the hopes that it will keep me going 🙂 So here goes! Of course, that is not how it began. Our beginnings are a bit more academic than magical. I love word games, I can say I’ve played more than my fare share on mobile, PC and the web. SpellDown took its shape from various ideas that I’ve had when I was in NID here in Bangalore. One of my earlier prototypes for the game was a physical one called Hoot. Hoot was a prototype for a small proposal I had written about Games as Cognitive Learning Environments for Children, which didn’t sadly go very far mostly because it was poorly received. Hoot was a simple word building game which gave away tangible rewards that were printed out from the game machine. My prototype was an interactive one and I didn’t have enough of the electronics know how (nor the time to learn new things) to pull together an actual working model. Without the data to back the idea, the proposal fell on deaf ears. 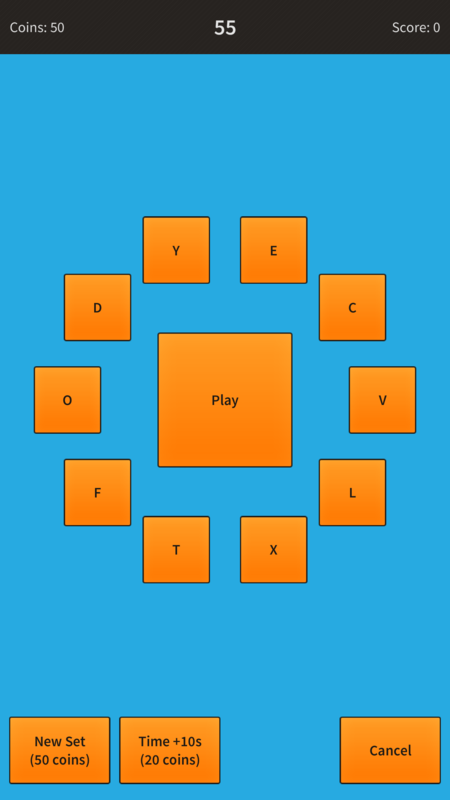 At around the same time my focus shifted to building a digital word game mostly due to the fact that a client wanted some research done on a Boggle clone. 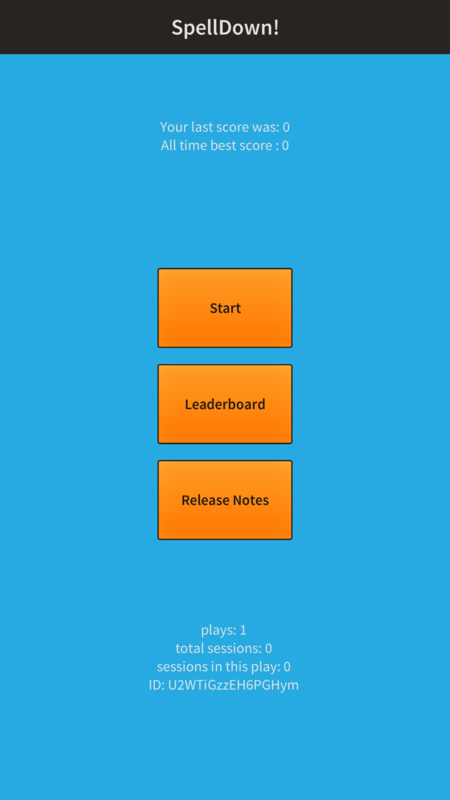 Armed with Flixel and AS3, I built a quick and dirty prototype, both for the web and mobile. Nothing came out of this exercise, except for the prototype and an increased fascination with word games. Although in hindsight, I wish I had delved deeper into the boggle board generation, but since the client required a fast turnaround and only a simple working prototype, that idea was never explored. A year had passed and I was working on some crazy stuff at Hashstash, one of which being our engine/framework that we dubbed TrivialEngine. Since I wasn’t so keen on mobile at that point and TrivialEngine was focused more on the desktop, I played around with the idea of a SpellDown using Trivial. One early mock up of a screen was the only thing that came out of it as we put Trivial on the back-burner. … and well, that is when SpellDown actually took some more shape, at least something more concrete than just an idea in my head. For the love of flash! By now, SpellDown, in my head had become a fast paced mobile game. But even with these wireframes, I wouldn’t start work on it for at least another two years. At this point, everyone and their dog was saying that Flash was dead, but would I listen? No. Hell this was still 2014, we still had some hope left! I decided to write SpellDown in Starling and Flash (and Feathers). I had just used Starling in a commercial game (that too strangely a multiplayer word game ) for a client and I was keen on doing something with it. I built the core game and it was fast paced as I expected, but that was it. It may be that the people I took the game to, played and got feedback from, were not the word game playing audience that this game would appeal to, but those early responses coupled with a lot of self doubt fueled by the environment that I was in at that point led to it slowly sliding back into limbo. A couple of years later I was at that point where I was weighing my options – I had finally stopped using Flash (of course I had a brief run in with it when I tried out Haxe and HaxeFlixel, but that is another story). A lot of us who were Flash/as3 aficionados were trying to find a new home and we were all doing similar things, we were trying out new tech that made sense financially, technically and in terms of ease of use; and most of us had GMS, Unity, Cocos2d-x and Unreal in mind mainly due to the way they were uniquely positioned. My focus at that point was primarily on GameMaker and Cocos2d-x with Unity somewhere in the far background. A new release from Unity changed that quite a bit, I put Cocos2d-x in the back seat and decided to give Unity a go. Unity had a huge community of users, great docs and support; and with this in mind, I revive the SpellDown! hoping that Unity will give it a new life! Unity was fun to work with, but my lack of experience with 3D art, c# and the engine itself took its toll. At that point I truly wished that there was someone who would just sit me down and teach me everything there was to know about it. I’ve been writing code and making software since I was in school and I’d gotten into the habit of doing the code, the UI and the art for almost everything I’ve done so far. The inability to do 3D art frustrated me so very much; and all the artists I knew who did 3D at that point were not in a space to teach me or collaborate, so I was stuck again. Eager to go back to 2D and do something , I decided that I would give GameMaker a try and found that GML(The GameMaker Language, the scripting language used in GameMaker) is not the most awesome thing to work in, but it bloody well gets the work done. To get a head start on GameMaker I started working on two games (‘cos who makes just one game at a time!? ), one a fast paced local multiplayer platformer and another a pool game. As with everything so far, what will this post be without going on a tangent 🙂 This will be a quick and meaningful detour, I promise! As I was building both games, I saw myself drifting into writing more frameworks and tools around the game rather than focusing on the actual game itself – I still wonder if it was a lack of motivation from within and without that led me to procrastinate so much. As a result I published 3 extensions on the YoYo Games marketplace. And one tool that I assumed will help me solve the technical hurdle of creating complex hulls for my pool game (for the tables in my pool game actually) – called Peasy. Between teaching and other non-academic work at school, I was trying to find time for these side projects; but alas, my commits became fewer and fewer till they ground to a halt. After Circulets, I hadn’t seriously invested time in cocos2d-x, which in hindsight seems like a big mistake. The only time I turned to it was when I jammed, especially during the GGJ. I had a chance to go back to Cocos with the Rhizome project at Serendipity in Goa late last year and the Global Game Jam after that. Since then, I’ve been sticking with Cocos2d-x and it is slowly starting to grow on me. I’m hoping that it will become my new Flixel.